Travel time vs. Capacity Utilization. As capacity utilization approaches 100%, costs rise exponentially. In simple terms, we are either traveling unaffected by the movements of others (which engineers call freeflow), or we are slowed by others (which we call queueing), either directly, due to interactions (such as congestion), or because of controls to manage those interactions (like traffic signals). In freeflow, the traveller or customer can choose her own speed without imposing her choice on other nearby travelers. She can choose her own time and receives immediate service at some “counter”: the toll plaza, the empty road, the waiter in a restaurant, the ATM, the website for booking a flight, the cashier in the supermarket, the advisor at the bank, the food counter in the cafeteria and many others. Utilization rate (ρ) is the ratio of arrivals (at the back of the line) per unit time (λ) to departures (from the front of the line) (μ). Crucial for the lived experience and for the planner or manager is that the waiting time in queues escalates to very high numbers when the degree of saturation reaches 80% to 85% of the available capacity. 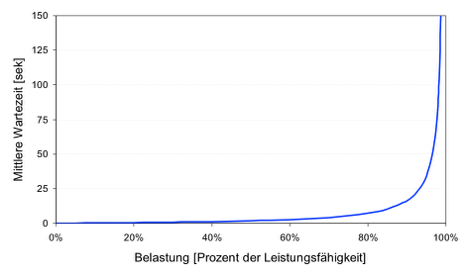 The Figure shows this explosion for the mathematically simplest to capture queue: one serving station with demand and supply following an exponential distribution of arrival and service times, in the notation of the field an M/M/1 queue. Still, this pattern holds across all systems of queues with any randomness at all. There are peaks of demand which the human preferences generate: we want to work during the day and have to work at the same time as our supply chain and customers and co-workers, we all want to be at the pool during the brilliant summer day, we prefer the fashionable cool restaurant or the McDonalds right next to big office building. Queues emerge in many transport situations: a group leaving a room having to wait at the door, as only one or two people can physically walk through it at any one moment in time; or a funeral procession occupying both lanes of a road but traveling at a slow speed. A system which works well with an uniform number of arrivals (1 car every 2 seconds exactly) sees queues form when it gets 4 cars in 1 second, even if it gets no cars for the next 7 seconds and thus has the same arrival rate. Queues emerge not only when demand exceeds the provided supply, but when the provided supply changes. The most visible example is when there is a physical change in capacity when traveling along a road, such as losing a lane, climbing a hill, or seeing a two lanes merge into one or even one lane diverging into two. But the supply can also change dynamically. Think about a toll plaza. Not all the tollbooth lanes are staffed all the time. If supply is roughly in sync with demand, the lines are short. If supply far exceeds demand, there are no lines, but when supply falls short of demand, queues are long. Unfortunately for the customer, no supplier can afford to provide so many counters or so much space in the transport system that travelers always encounter freeflow conditions. The supplier wants to offer a certain level of service, i.e. speed or waiting time until service starts, but without having too much unused space, empty seats in the bus or train, or underemployed staff, which are costs without revenue. Furthermore, providing capacity encourages the users to arrive at the peak time, which makes the peaking problem worse in the longer term. To make things worse in daily practice, the capacity of the serving stations varies randomly around a mean for a variety reasons: weather, lighting conditions, the experience of the drivers, skill level of the person serving, random crashes in computer networks.